Ben is a cute little boy with a shy smile and the cutest little voice. When his baby brother was on the way, his mom and dad decided it was time to give him a big boy room. His nursery had a robot theme, but they wanted to move towards a space theme while keeping some of the keepsakes he had in his nursery. That is the best thing about having a loose theme—you can add anything to it! We got to work on Ben’s space-inspired big boy room and took note of everything his parents wanted to reuse—the lime green and light blue window treatment with planets on it, the red, lime green and white star wallpaper on the ceiling, the orange and lime green UFO and robot artwork, the box wainscoting around the room and the planet mobile. It would have been easy to get overwhelmed with all of these different components that we were asked to reuse in the room, so we decided first that we needed to modernize the space a little. We added some mid-century touches to the room to make it feel updated and more sophisticated. Plus mid-century looks a little space age, which doesn’t hurt! Starting with the wall above the wainscoting, we decided to keep it simple and paint it a rich charcoal color to create the illusion of outer space. Then we created some “constellations” with white yarn and roofing nails that we spray painted white. We actually drew up a template of how we wanted the constellations to look behind the bed, printed it out and applied it to the wall. Easy! When it came to the bedding, we found some fun robot pillowcases from The Land of Nod. We didn’t want to over-do the theme, so we paired them with simple black and white sheets and a green quilt, and then we added a navy duvet with cargo pockets at the end of the bed. The galaxy sconces on either side of the bed are from Rejuvenation, and they look positively space age! Not only do they look cool, but they also have lights that can shine up, down or both! We decided to hang these a little higher to bring some height to the room. The Dorma bed from Monte Design is a fun addition to the room. It sits a little lower to the ground, and you can choose to have upholstered rails added to keep little ones from rolling off. It’s easily customizable and even has a trundle underneath for when Ben is ready to add sleepovers to his repertoire (or when he decides little brother is cool enough to hang for the night). In the far left corner of the room, we added a little reading nook area. The chair from Urban Outfitters looks so adorable here. The rug really ties everything all together. It has the same colors as the existing window treatment and brings the color across the room. Lastly, we found a simple gray dresser that we dressed up with fun accessories and some octagon shelves that were being used in another room. Talk about a find! We had a couple of the octagons painted to coordinate better with the room and had a couple more made to create a fun shape above the dresser. Then we styled it with some fun accessories. You can create a similar look with honeycomb shelves from The Land of Nod. We hope you’ve enjoyed this little tour. 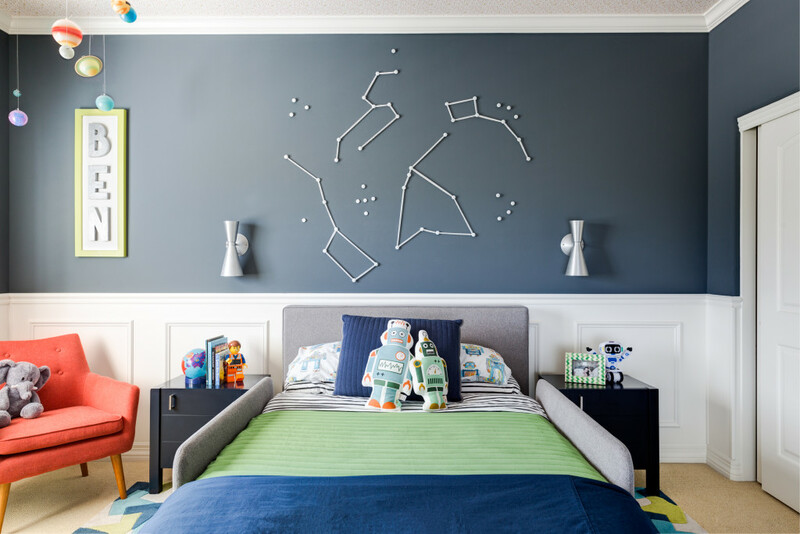 We really enjoyed pulling this little guy’s space-inspired big boy room together. Now it’s time to design the eldest boy’s room. His favorite thing? Airplanes…Stay tuned! Love this room! Could you tell me the color of paint you chose? I’m curious about what the paint color is as well! Please do share! I’m curious about what the paint color is as well! Can you Please share? Is the paint color a secret? I’d love to know too. Thanks! Where did you find your octagon shelves at?